We’d love your help. Let us know what’s wrong with this preview of The Energy Crusades by Valerie Noble. After the Great Oil Wars destroyed the majority of civilization on earth, an alien race has colonized the planet creating a society whose only currency is energy. Humans must wear energy suits and are required to earn their energy daily, while also supporting the grids that fuel society. In addition, all children must join an Energy Crusade by the time they are 18. The hig After the Great Oil Wars destroyed the majority of civilization on earth, an alien race has colonized the planet creating a society whose only currency is energy. Humans must wear energy suits and are required to earn their energy daily, while also supporting the grids that fuel society. In addition, all children must join an Energy Crusade by the time they are 18. The higher the level of danger assigned to the Crusade, the higher the energy payout. Kaia Robi has trained her entire life as an Athlete for the Reformation Republic. Her ability to generate energy for her grid has afforded her a life of privilege and celebrity, but has cost her personal friendships and freedoms. She is strictly monitored and sequestered, until she heads to the University to join an Energy Crusade. She is paired up with an old childhood friend, Ajax, but he is determined to ignore their former bond, making life at the University even more difficult. As Kaia and her team begin to complete their missions, she and Ajax learn that they excel when training together. Despite increasing tension, they are able to form a united front while training. They will encounter virtual fighters, cave dwellers, and resisters, while competing against other teams to become an elite class. To ask other readers questions about The Energy Crusades, please sign up. PLOT: See the GoodReads pitch. COMMENTS: This was a real page-turner–I finished it in two sittings. You get love and adventure, in a setting similar to ENDER’S GAME meets DUNE. There are certain passages where the love story tugs on your heartstrings, particularly since it isn’t fulfilled until the very end. The two protagonists, Kaia and Ajax, are very young, but they make the same mistakes people twice their age repeat over and over. So the love story never feels juvenile. Through Kaia’s eyes, we witness a world that many people today dream of–that of performance athletes. She and her fellow football player are showered with honors and glory. What most people don’t envision is these athletes’ life of work and sacrifice. I found their resentment of the “simple people’s” privileges (the parties, the easier schedule, having a girlfriend/boyfriend, etc.) realistic and lacking the fake luster that sometimes taints sport books. Both parties (the students and the athletes) believe that the others’ life is perfect and such, a mutual resentment is born. Even Ajax, Kaia’s love interest, begrudge her genetics, fact which snowballs in an “I hate that I want you, but I don’t want anyone else to have you either” situation. While unfortunate, I found Ajax’s reaction quite realistic and it made me pine even more for a happy ending. When at last Ajax accepts himself as Kaia’s equal and welcomes her in his life is very satisfying and leaves room for further development. What really stood up for me about this book was the well-fleshed futuristic world. We encounter a believable high-tech civilization, with a historical backdrop that justifies it. Even the frivolity you’d would expect from teenagers is dampened by a society in which children must earn their energy. Through Kaia’s reverence for the order and asceticism of her life, the reader imagines what all other people desire–or fail to desire–we see the humanity’s obsession with the idea of energy. And here comes the interesting aspect: in a general sense, the totalitarian regime is right. Squandering the energy caused the downfall of the human civilization. So are the antagonists wrong to toughen the measures that would prevent a similar turn of events in the future? They aren’t. Their crime occurs when they use history as a brainwashing instrument for furthering their own goals–genetic manipulation. I'm looking forward to the sequel. TECHNIQUES: This is a multi-narrative told in the first person, with a linear plot. Noble has taken some pretty interesting and classic ideas and infused them with some subjects studied in high school to create a full-out, action packed novel. The ideas that she has, and the self-sustained lifestyle she has created, is so intriguing to me. Although I feel like the world itself has gone a little far for my comfort, some of the ideas (like harvesting your own used energy) is such a crazy futuristic, yet realistic idea. Kaia is a fortunate but simple individual. Her purple eyes however, show how special and unique she truly is as a person. Without having any real friends though she is nervous about starting her new training for the crusades. When she finds out that her childhood best friend (Ajax), and his mother (Professor Baal) would be training her the nerves eased a little. She was full of nerves and excitement as she set up, until she realized that Ajax blamed her for being kept back and wanted nothing to do with her or her training. When I started reading this book I was captivated. I could not put it down until I reached the very end. Valerie Noble's first book is very well written and to me is better than some of the bestsellers I have read in the dystopian category. Ms.Noble gives you believable characters that work perfectly together to form the plot of this book. If you loved The Hunger Games and Divergent this book will not disappoint you. Lots of adventure, suspense and the main characters are falling in love. A page t When I started reading this book I was captivated. I could not put it down until I reached the very end. Ms.Noble gives you believable characters that work perfectly together to form the plot of this book. If you loved The Hunger Games and Divergent this book will not disappoint you. Lots of adventure, suspense and the main characters are falling in love. A page turner. I will definitely be reading the sequel. When I began reading this book I was unsure of how to feel about it. It seemed a little dystopian, but with a little romance (both right up my alley). However, there was something about the descriptions I read that didn’t seem to fit with the story. Despite the basic grammatical errors, some strange chapter choices, and perspective switches, I loved the originality and creativity put into this novel. An astute and intelligent science fiction tale from the mind of one Valerie Noble. The Energy Crusades is a fully realized and relevant world where Energy is the only currency. Visitors from afar arrive to save the Earth but are they the saviors they appear to be? I became fully engrossed and invested in this thrilling tale from beginning to end. Valerie reveals this world to us little by little. Each chapter we discover something new. I don't want to spoil all the technological advancements she' An astute and intelligent science fiction tale from the mind of one Valerie Noble. The Energy Crusades is a fully realized and relevant world where Energy is the only currency. Visitors from afar arrive to save the Earth but are they the saviors they appear to be? I became fully engrossed and invested in this thrilling tale from beginning to end. Valerie reveals this world to us little by little. Each chapter we discover something new. I don't want to spoil all the technological advancements she's predicted but you will want all of them to exist once you're done reading. But what is a beautiful world if you don't care about what's going on in it. The book chronicles the struggles of Kai and Ajax and their training at the university. If you loved books like Ender's Game you will find this an energetic and exciting read.The training missions are unlike anything else I've read before. 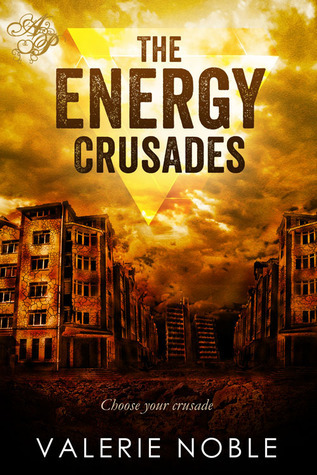 The Energy Crusades is a worthwhile read for science fiction, young adult, and dystopian lovers.